The potentialities of the medium of screen acting first became apparent to me at the age of 14 when I saw Robert Deniro's collaboration with Martin Scorsese, in particular; Taxi Driver, Raging Bull, Goodfellas and Casino. The discipline, intensity and devotion to craft and artistry, gave me the idea that a search for meaning in life was possible through performance in film. In method acting; ideas, expression, mind, body, voice and heart are all inextricably linked towards a praxis, poetical in nature, truthful at its core. The goal to express the essence of what it is to be human under a single observing eye, the camera. Behind the camera, the director, and behind the director an audience, but in observation is there really any separation between participants? In this way the observer is also the subject, and the subject the observer. It's no mistake that DeNiro's father was a painter, I imagine him sitting in his father's studio on the couch watching the love and devotion towards the figures he painted on his canvas. DeNiro Junior has preserved his father's studio exactly as it was when he passed, as a tribute. He discussed his reasons for doing so in the recent HBO documentary Remembering The Artist Robert De Niro Sr.
Around this time I also became fascinated with the work of perhaps one of the greatest observers of people Lucian Freud. The camera never lies, can the same be said of the brush? 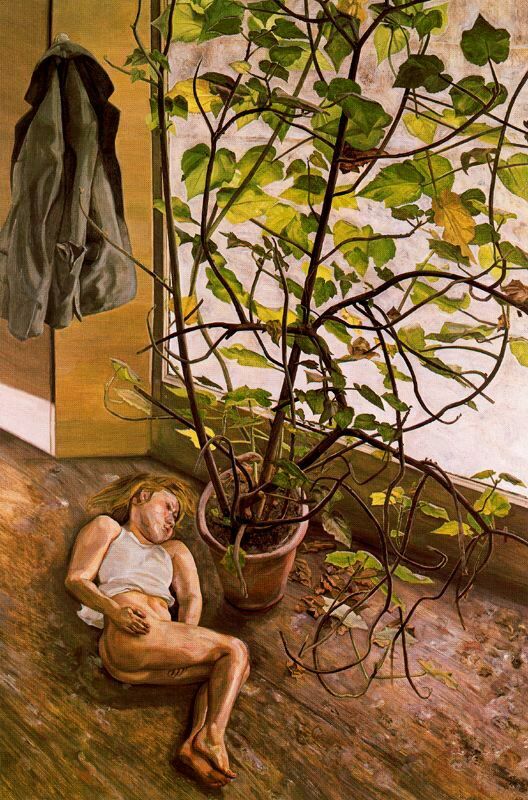 Lucian Freud, one of the greatest masters in oil painting ever to put brush to canvas, amazingly lived and worked not too long ago, passing in 2011. Proving that conditions are still possible for a master painter to emerge in our society. 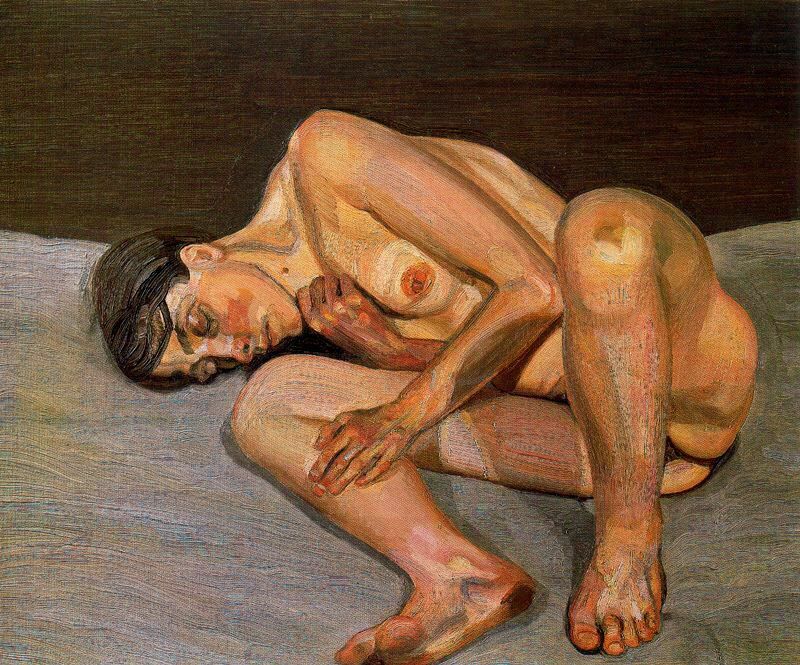 Freud was arguably the greatest figurative painter in the 20th Century, although Francis Bacon, Frank Aurbach and Leon Kossof gave him stiff competition. 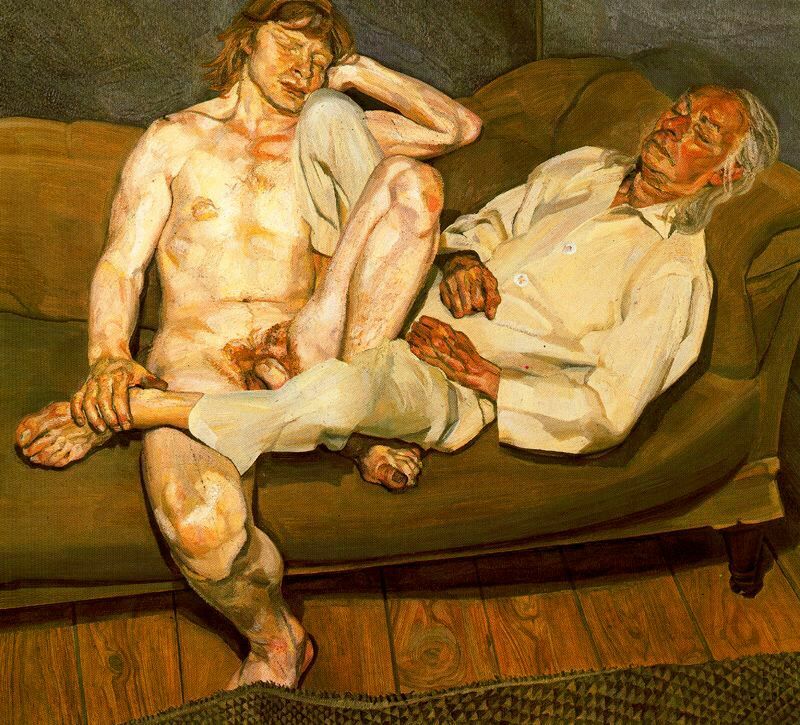 His importance to the market can be explained more easily, Lucian Freud's 1995 painting 'Benefit's Supervisor' sold in 2008 for $33.6 Million, setting the world record for an auction price for a living artist. Their is actually a glaring irony to the price tag that comes with these pictures, as the subjects display their weakness, their lack of symbols of wealth, lack of pretence, their powerlessness, therein their humanity. Here is a photo of me and my mother at the exhibition I curated in 2005 aged 18 which included 5 Lucian Freud prints. As the human subject takes the focus of the picture, there is an aura to their vulnerability, it's no wonder they appealed to me so strongly as a young actor. It's often commented that the subjects of Freud's portraits appear powerless, It is as if Freud at one point walked around the National Portrait Gallery and thought, what's really going on here? What about the real person beneath the personae. When you take off a person's clothes and lay them down on a couch and just talk to them until they fall asleep, are they still Lord and Lady bla di bla, or are they as flesh and blood as you or I. Even if this revelation of an anti-portrait came to Freud under the circumstances I so speculatively outline above, no revelation occurs independent of the revelator. 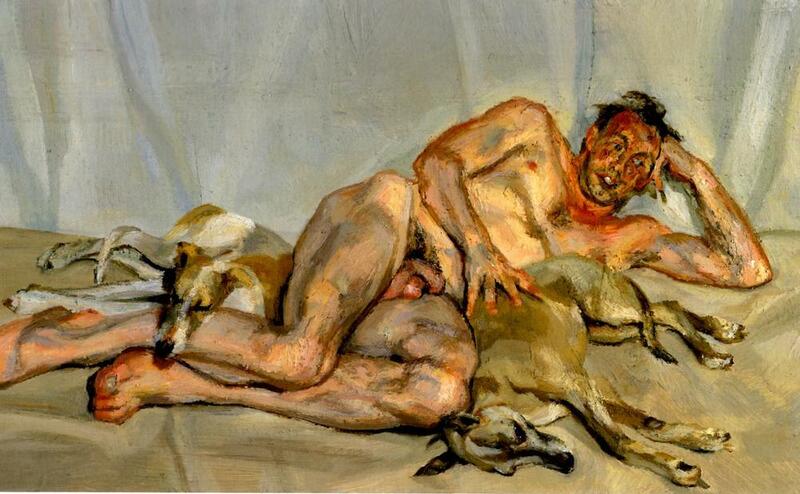 Lucian Freud is the grandson of Sigmund Freud, the grandfather the psychoanalytic method, which I will explore further below. 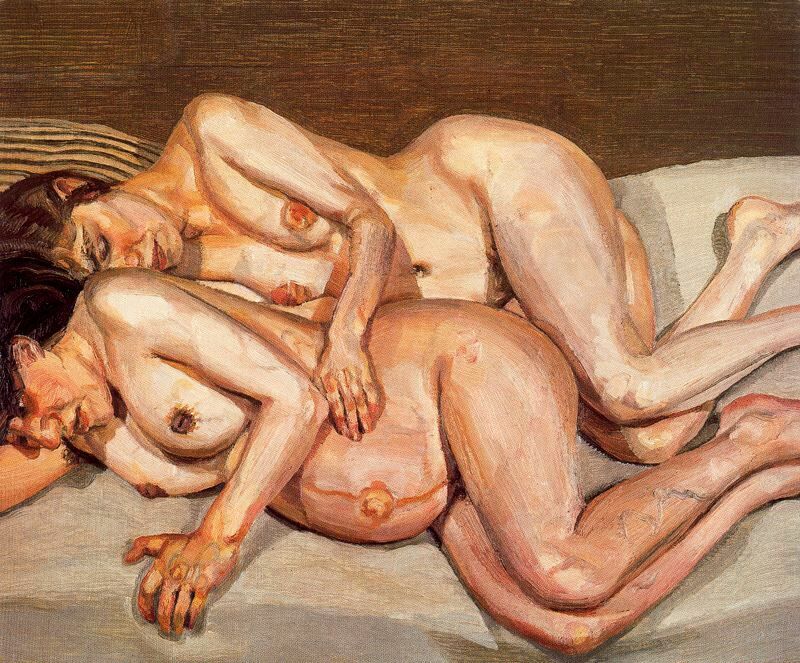 Unlike certain other contemporary artists like Andy Warhol, the reason for Lucian Freud's success cannot be solely determined by market forces. There is a deeper reason inherent in the paintings themselves. Though hammer price may give us a brief glance at his cultural significance, what concerns me today is his fascinating process. 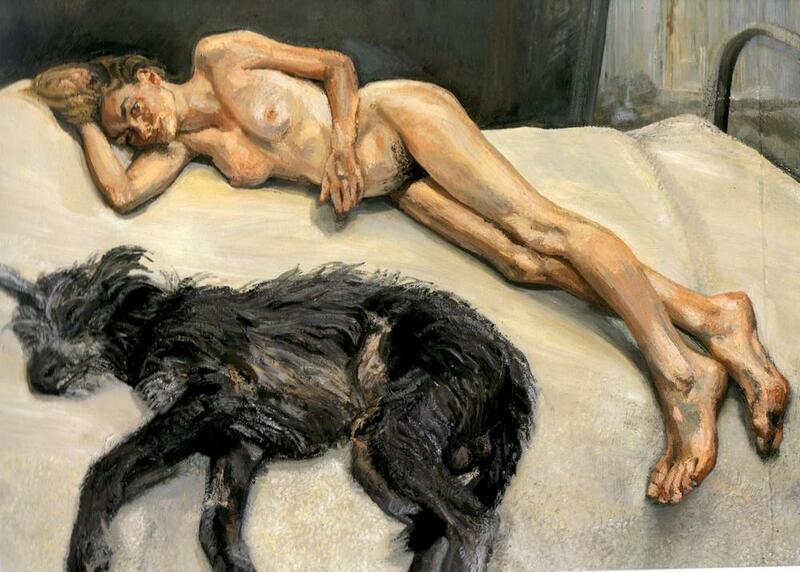 We see the person he is painting in their most vulnerable states, often naked and asleep. Nothing is hidden, and certainly not photoshopped. We usually only see people sleeping when they want us to, when after a long period of knowing them they trust us enough to let go of their means of control and allow us to decided how to behave, with only our compassion as our guide. This intimacy could only be created by the extended period of time each painting took to create. I have sat briefly for other painters, but never anything as intensive as with Lucian. It did give me some insights into why he was such a remarkable artist. There was, above all, that self-criticism and rigorous scrutiny of everything he did after he’d done it. He was not a painter who believed that anything was good just because he’d done it. And he also insisted that a portrait took as long as it took. There was never a timetable. He simply carried on for as long as it required for him to be satisfied. And, if he wasn’t satisfied, he would tear the canvas up, or even put his boot through it. Over the time we spent together, he would talk a lot about other painters – both those he admired and those he didn’t. He had bracing views. He felt, for instance, that someone should write a book about what a ghastly painter Leonardo da Vinci was. He didn’t like Raphael or Vermeer either. He wasn’t keen on the idealised human forms they painted. 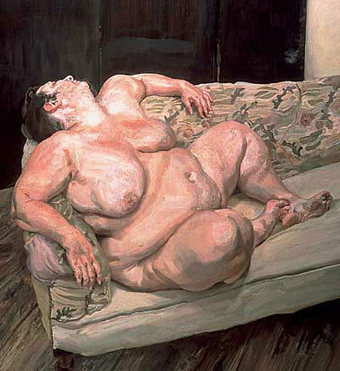 David Hockney says that he posed for 130hours for this painting. The nakedness and quietness of the subjects have been compared to existentialism, as if stripping the subject of their status symbols, Freud was stripping his subjects of their meaning, yet this is to judge the human being by the identity they present to you. Personae may gives clues as to the truth of the person beneath, but rarely if ever literally, personae is usually an expression of where a person is powerful. Like when a loud and oblivious tourist, tramples through a vibrant forest, nature recedes, the birds fly from their nesting places, the mammals avoid the source of agitation. So to does the individual present symbols of status to deter the agitating tourist. This is called embodying the light." When a sage walks through the same woods, he is in his element and in alignment with all life around him, existence presents itself. 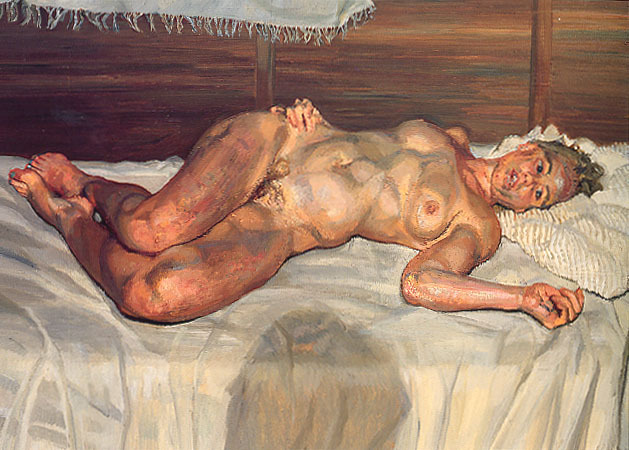 Lucian Freud is like that sage, his subjects in their calm reveal their true selves. 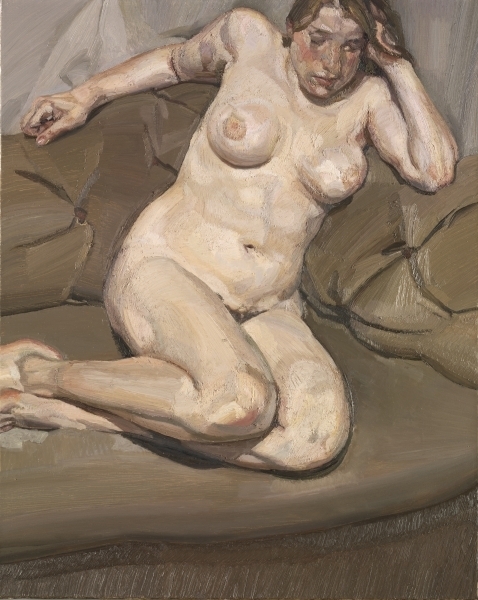 When painting Martin Gayford, he told his subject “I try to impose my ideas on my sitters as little as possible”. The viewer is given that rare glimpse through the eyes of the sage, out to the world of people. 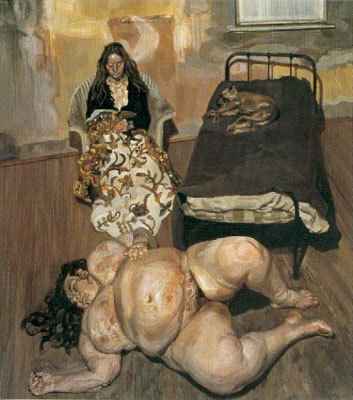 In this way Lucian Freud is like a great film director, the subject through his work the viewer is given opportunity to be the artist and perceive. The subject exposed to perception, laid bare. Perhaps the best example of this stripping of personae was his collaboration with Leigh Bowery. Bowery was a flamboyant exhibitionist, a performance artist and the very definition of showman. Often appearing on talk shows and night clubs in full blaring costume. He was loud and exciting. When stripped bare penetrated by Freud's gaze, we see the man, the substance beneath the style. Leigh Bowery posing for the 1994 "Leigh Under a Skylight"
Here can be seen during his last days of life, he died soon after due to AIDS-related complications, aged 33. Bowery would spend his entire days dressing up and putting on make-up creating masks for himself to then present to the world. Here we are permitted to see his real face, not so directly through the cold directness of still photography, but beneath the painted layers of a canvas. The seer and the seen. The self and other. Perhaps under the patriarch of Sigmund Freud (Lucian’s grandfather) there was a culture of psychoanalytic judgement of the psyche, the faint impressions of the ideology filtering into the family structure. The family’s relations to each other, seen through the structure of an observing ideology, espousing an objective position to perceiving other human beings. It’s reasonable to assume these manifested into the insecurities of the young, Lucian’s difficulty being observed directly by another person, (he was until his death extremely reclusive, even at the height of his celebrity) and his comfort in the position of observing another person. 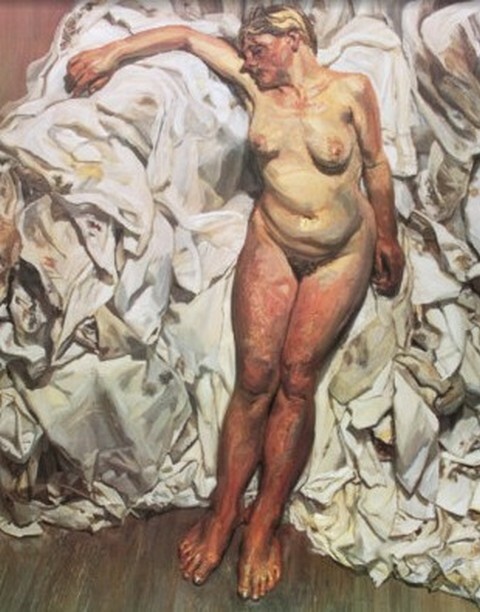 Actor’s wish to be observed, and we are rewarded for expressing our weaknesses and vulnerabilities in public.Lucian Freud’s subjects and their relation to the culture once released have a much similar affect as a performance in a film. 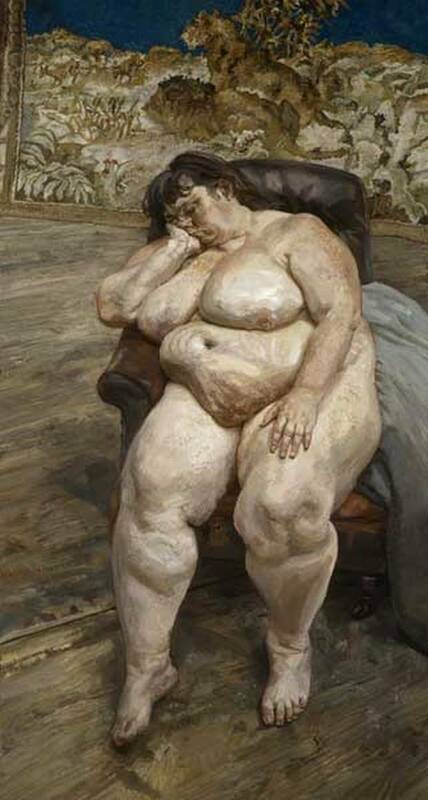 The vulnerability of the subject displayed allows the viewer an uncommon insight into the experience of the subject. Julianne Moore won the Oscar for this performance, one of the highest status symbols our society has to offer. In this curious paradox expressions of quivering vulnerability are given power by the dominant culture. 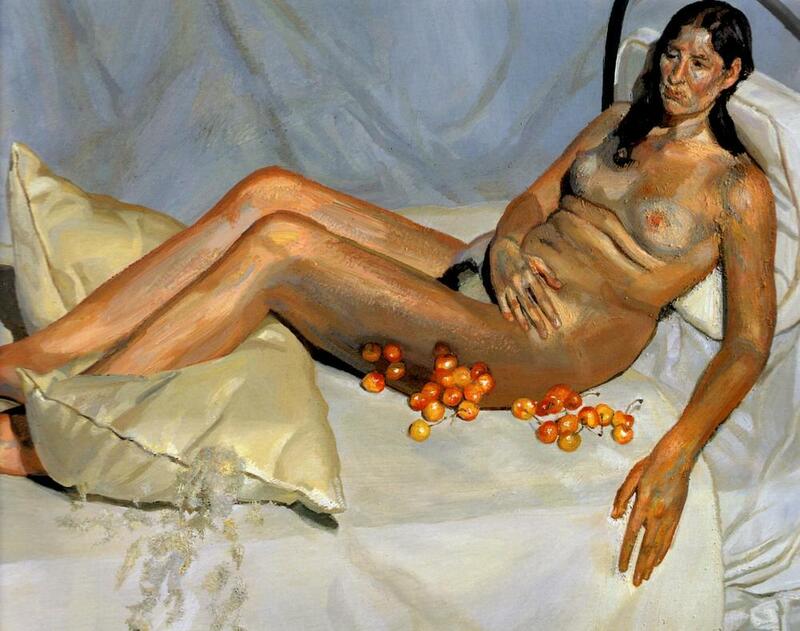 Vulnerability in art is honoured with the highest symbols of status our society has to offer. This is the fatal flaw of all great actors, they are rewarded for their vulnerability in a world built on power structures. In a film we see it’s subjects, the actors, we see what the camera sees, we see what we want to see, we see the story. We are connected, arguably more so even than any other medium, perhaps with the exception of theatre. Both directly and indirectly to each other. As the observer and conductor of the narrative, creator of the variables of the world we see on the screen, the director reveals himself. In participation of the present, engagement with what he sees the actor reveals himself. He plays to a shadow Audience. The talent of the subject comes in revealing their true selves in front of the gaze of the observer, without agenda.